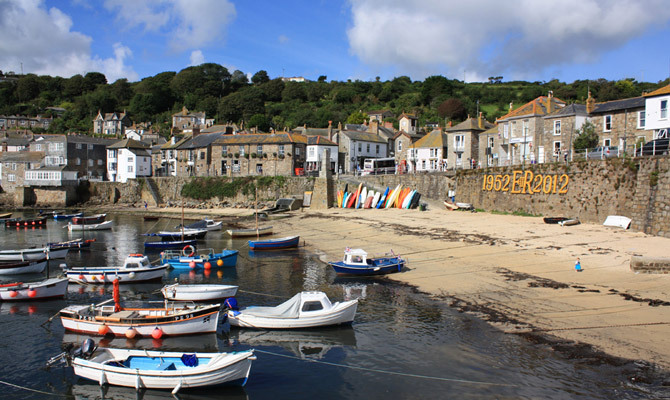 MOUSEHOLE, a village in St. Paul parish, Cornwall; on Mounts bay, 2.25 miles S of Penzance. It was formerly called Porth-Enys; was once a market-town; was burned in 1595 by the Spaniards; is now a seat of the pilchard fishery; and has a post-office under Penzance, a coast-guard station, and a Wesleyan chapel. St. Clement’s Island lies opposite the village near the shore; and had formerly a chapel. A charming terrace-road, with very fine views, goes along the margin of the bay from Mouse-hole to Penzance. View all Commissioners & Officers here. The present bye laws, dated 1983, are currently being re-drafted and should be released in 2014. Bye Laws are available to download as a PDF file. Please click below to download the latest version. Jet skis, speed boats and divers are prohibited from the harbour. Mousehole is a 'Trust Port' - an independent statutory authority governed by a board of 11 harbour commissioners who meet approximately every 6 weeks.